Evan Whittaker of Mecklenburg crosses the finish line first, in a time of 18:04.33. 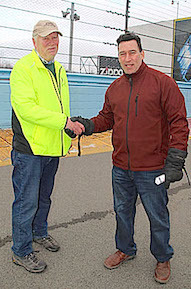 WATKINS GLEN, April 6, 2019 -- Hundreds of runners and walkers braved 40-degree temperatures Saturday morning for the sixth annual Arc of Schuyler Grand Prix Run/Walk on the Watkins Glen International race track. The event -- with the facilities provided free of charge by WGI -- raises funds for The Arc, a not-for-profit organization providing support to people with intellectual and developmental disabilities, including autism. Groups, individuals, friends and parents with youngsters were among the racers and walkers -- who began within a minute of the scheduled 8 a.m. race start. 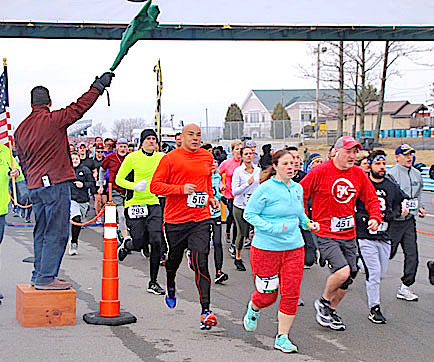 The event covered the 3.4-mile long track -- including WGI's "boot" section -- with participants going in the opposite direction from that normally used by cars at the track's race events. 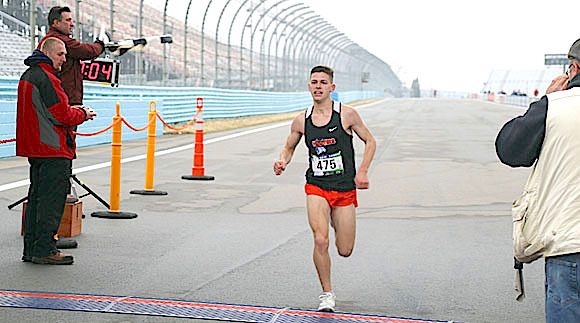 First to cross the finish line was Evan Whittaker, 18, of Mecklenburg, in 18:04.33. He was followed a minute and nine seconds later by Tim Stahlnecker, 30, of Waterloo, who greeted a grinning Whittaker by saying "You're an animal!" Whittaker laughed. Stahlnecker won the race in 2016 and 2017. The Arc run/walk was part of WGI's season-opening day -- which later included admitting vehicles to the track for pace laps. Cars were gathering at the facility's entrance as the Grand Prix Run was wrapping up its festivities, which included the presentation of awards. An After Party was planned for later at the Grist Iron Brewing Company. First female to cross the finish line was Brieanne Smith, 34, of Horseheads, in 22:18.63 -- 11th overall. The female runner-up was Melissa Woodward, 33, of Elmira -- 23rd overall. Many walkers participated, some finishing in an hour or more. Then came free refreshments, and the presentation of awards. The event was timed by AuyerTiming.com. To see a complete list of finishers, you can click here. Top: Runners start out on the Arc Grand Prix run. Middle: Sarah Schlueter-Eisman sings the National Anthem. Bottom: Planning Committee member Rich Greenberger holds the American Flag aloft as Sarah Schlueter-Eisman sings the National Anthem. From left: Race participants Kelsey Wood, Matt Hayden and Ellie Fausold. Left: Planning Committee members Tom McGarry and Rich Greenberger. Right: The cannon blast triggered by McGarry signaled the start of the race.